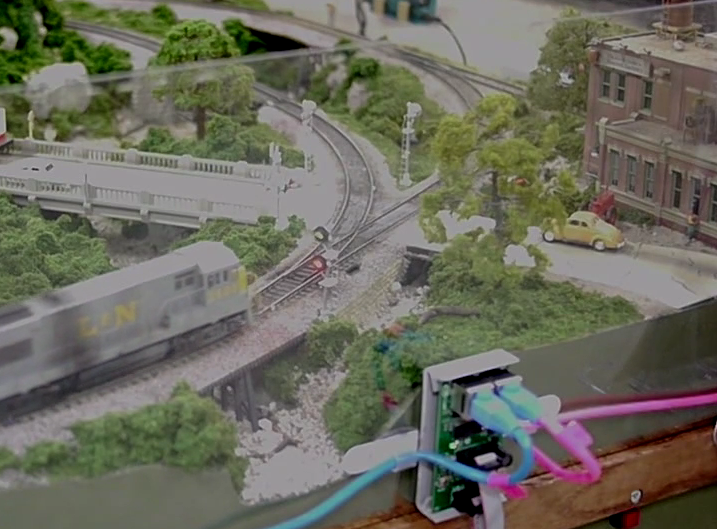 This second video taken of the Bridge Street crossing shows one of the 4 RR-CirKits Tower-LCC nodes that were controlling the layout's turnouts, signals, and crossing flashers. A fifth node was located in a stand alone control panel, the back of which may be seen at the furtherest corner. The panel is built into an extra depth Wallmart picture frame suspended from a screw on the Lexan sides. The crossing gate logic was complicated by the fact that both crossings had turnouts in them. 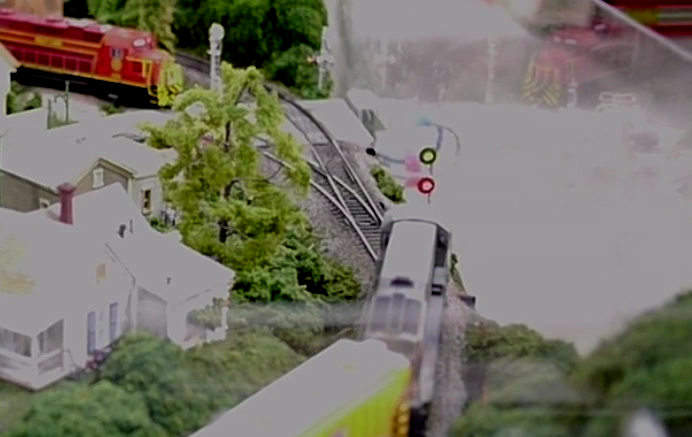 A train approaching a Stop signal due to turnout position does not trigger the flashers until the turnout position is cleared. All the LCC components were attached on the outside of the layout's Lexan sides where viewers could see them. The attached computers (for example the Raspberry Pi seen to the left of the Barrel Factory) were for remote monitoring and/or turnout control only. All the signaling and crossing flasher logic is running in the I/O nodes themselves.